If you saw the photograph I posted yesterday of the winter sky at Acker Lake you’ll notice that today’s shot is a lot brighter! While it is still quite cold we woke this morning to a sunny sky! This is another shot from a doggie walk with Duke, but this time the shadows and brightness make an interesting pattern on the snow. Again, I think color does this shot justice rather than black and white. We are having a heat wave! It was actually above zero this morning when we went for our morning doggie walk. It’s been below zero the past couple of mornings so the camera has been left at home and the dog walks have been rather short. This morning it was about 4 above so I grabbed the camera for the Duke walk since he could stand a little longer walk. 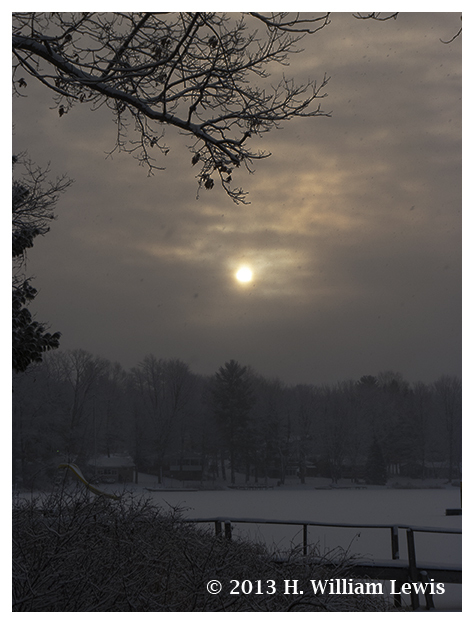 It was a beautiful winter morning here at Acker Lake. 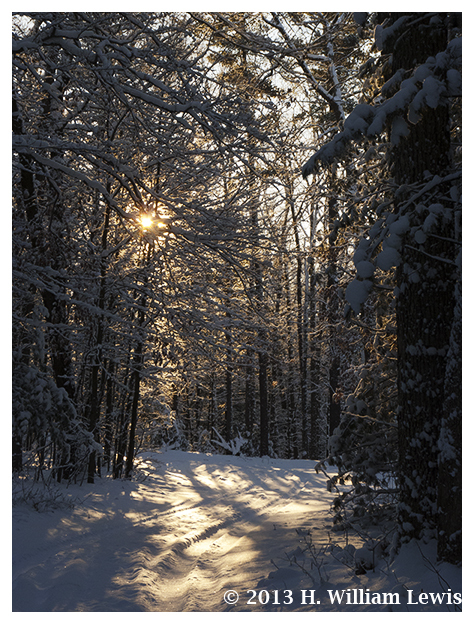 The snow that’s been falling off and on for the past few days has left the trees covered with shimmering, sparkling snow when the sun breaks through the clouds every now and then. This morning there was a morning haze, reducing the beams of the sun to a soft round disk that just peeked through the clouds. Definitely a moody winter morning. I thought of converting the shot black and white, but the more I played with various tones it seemed to speak to me saying, “Leave my monochrome look alone!” And so I did. We have a couple of possums that have decided to spend the winter with us. One of them has taken up residence in the garage where he or she can share the cat food with the indoor/outdoor cats while the other one seems to come and go at his/her leisure. 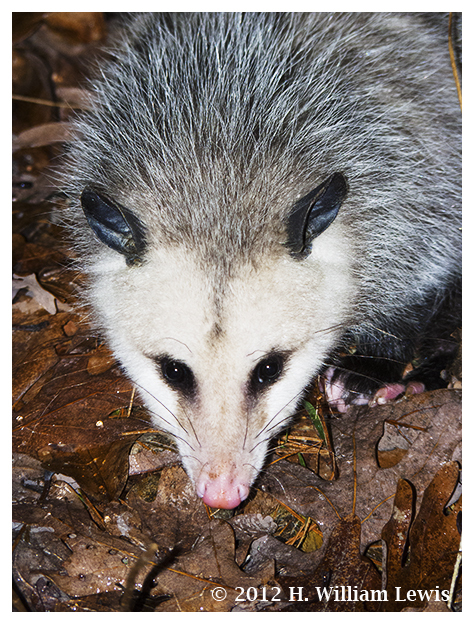 The other night the “come and go” possum decided to come while our black lab Duke and I were out for a potty break (Duke, not me). Fortunately Duke was on the leash so we didn’t have a real confrontation, just a lot of barking which caused the possum to run to the nearest hiding place, an open garden area where it lay frozen to the ground. After I took Duke in the house I went back out with the camera and took a few shots as it lay there ignoring not only my presence, but the light from the flash. I didn’t realize just how still they can be when they feel threatened. I went back in the house and when I looked out about 5 minutes later it was gone. So here we are, 2013. In 1956 when i graduated from high school the year 2000 seemed so far away. 44 years seemed like such a long time. But, one day at time it came and went and now 13 years later we are living what we helped shape over those past 57 years. I guess I’m waxing a bit nostalgic this morning, January 7, 2013, but I’ve been thinking about what I want to accomplish this year. At age 74 there aren’t going to be all that many years left! I really don’t have a “Bucket List.” I don’t know what the future holds. (I do know Who holds the future, however). I can only look forward a day at a time. And that’s okay by me. In my world of photography I want to produce more black and white photographs this year. There is nothing wrong with color, however black and white was my first love and still remains that today. I learned to process black and white film and then make the print in 6th grade and always felt there was something magical in watching that piece of paper, floating in the developer start to produce an image. And even though my wet darkroom days are over, the magic still remains of working with raw digital files, tweaking here and there and watching the image as it changes on my computer screen from the color image that was captured to the black and white image I saw in my mind. 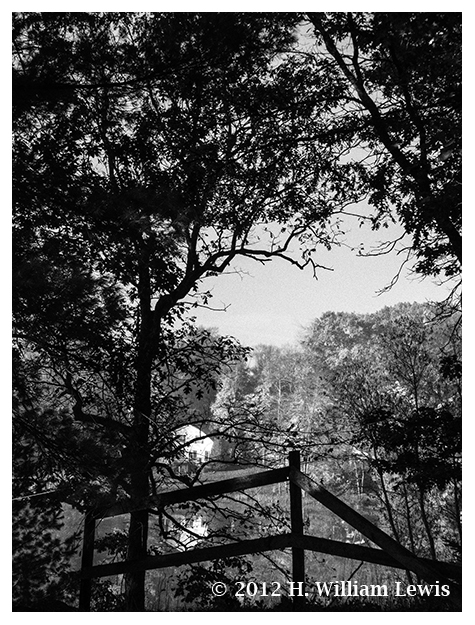 In photography, I want to shape my 2013 world in Black and White… How will you shape your world? The sun had set on 2012 and we begin a brand new year. The mistakes, the failures even the success are in the past and though they remain in our memory there is no way we can go back and change them. We live with the past but we look forward to the future. The pages are blank, ready for us to write upon them what we will. While there are many aspects of the future we can not control, we can control how we respond. I am not one to make new year’s resolutions, I am going to make a few for this new year. 1 – Live every day to the best of my ability, putting the needs of those I love first. 2 – Prioritize the plans for the day, making the things that need to be done a first priority. 3 – Spend some time each day thinking about how good my life is and how blessed I am to be just where I am. 4 – Let my children, grandchildren, great-grandchildren and their families know how much I love them, respect them, and am proud of them. 5 – Photograph, write, blog and learn. And to all of you, may this new year bring you all the joy, happiness, and promise that you wish for.